Shirley Maly will present the Nebraska Literary Heritage Association's March Lunch at the Library talk. Shirley is a lifelong Lincoln resident. After a long career in public relations, at age 60, she joined the Peace Corps and served for three years in Uruguay. That stay and other travel experiences were the basis of her book Love Affair with the Americas. 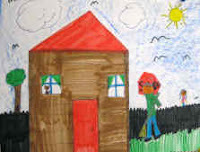 Shirley's topic will be "Pictures Tell Stories: How Illustrations Enhance the Story." The program will begin at 12:10 p.m. on March 3 on the fourth floor of Bennett Martin Public Library at 14th and N Streets in downtown Lincoln. Feel free to bring your lunch, free coffee is provided courtesy of the Mill. We look forward to seeing you. 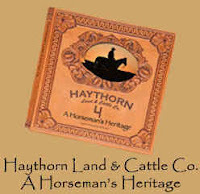 Lisa Norman, Haythorn Land & Cattle Co., A Horseman's Heritage. A pictorial essay by Lisa Norman. (introduction by Red Steagall). Kansas City: Trabon Printing, 2007. This coffee table book explores ranch history and work life through the seasons on the famed Sandhills ranch founded by Harry Haythornthwaite and his wife Emma in 1884. The Haythorn ranch raises Angus, Hereford, and Longhorn Cattle and is especially famed for the quality of its foundation-bred Quarter Horses. The Haythorn ranch did not mechanize to the extent that others did, finding it more economical to continue to raise and use Belgian/Percheron work horses to stock hay in the summer and to feed cattle in winter. Author-photographer Lisa Norman has lived and worked on the Haythorn ranch since 1995. She does a wonderful job of capturing the working landscape and people of the ranch. Anyone interested in the Nebraska Sandhills, in the survival of traditional ways of life, or in horses, might enjoy this book. Heritage Room uncatalogued holdings include Nebraska photographer Charles Guildner's album of photographs, Lives of Tradition, Vol. 2, Scenes. (9 in a limited edition of 20), also with some scenes from the Haythorn ranch. John Janovy, Jr. Pieces of the Plains: Memories and Predictions from the Heart of America. Lincoln: J&L Lee Co., 2009. John Janovy, Jr. is one of Nebraska's human treasures, a distinguished scientist who has also written for broader audiences. Seeking to show us what "there is to learn from nature rather than about nature," Janovy is the author (and illustrator) of some of the most admired books and essays in American natural history, among them, Keith County Journal, Return to Keith County, and Dunwoody Pond: Reflections on the High Plains Wetlands and the Cultivation of Naturalists. He has often written about how young people learn, and about the philosophical and social consequences of our contested and evolving understanding of nature and our place in it. This is a very personal book about the issues Janovy cares most about. The Loren Eiseley Reader, published by the Loren Eiseley Society, 2009, with an introduction by Ray Bradbury is intended to remind us of the work of the anthropologist, essayist, and poet, and to introduce that work to a new generation. Eiseley, who grew up in Lincoln and attended the University of Nebraska, was a pioneer in asking us to reconsider our place in the natural world and think about the limits of our scientific and technical mastery. Eiseley was a brilliant essayist, with a capacity to pull his readers into his own inward experience of nature, his "night country" and then carry them along along on his journey into a new scientific and humanistic understanding of the waking world. The Reader is a collection of short pieces and excerpts from Eiseley's best known works. Mari Sandoz, Capital City, a new edition with an introduction by Nebraska born writer Terese Svoboda. (Lincoln: Bison Books, 2007). This new (to our collection) paperback edition has a wonderful period cover photograph that could remind us, as Ms. Svoboda does, that when Sandoz was writing this in Lincoln in the late 1930s, some Lincoln families were finding their food at the municipal dump. Capital City contains some of Sandoz's most angry writing. Kwakiutl L. Dreher, Dancing on the White Page: Black Women Entertainers Writing Autobiography (Albany: State University of New York Press, 2008), explores the popular autobiographies of well known Black women entertainers, including Diahann Carroll, Dorothy Dandridge, Lena Horne, Eartha Kitt, Whoopi Goldberg, and Mary Wilson. The author was our February "Lunch at the Library" speaker. George E. Hyde, Rangers and Regulars (Columbus, Ohio: Long's College Books, 1933, 1952). New to our collection, this book surveys Spanish, Mexican and American conflicts with the mounted Southern Plains Indians, especially the Comanches. Omaha resident Hyde was a prodigious researcher with a deep interest in Native American history and contacts in many tribes. Legally blind, he was sought out by George Bird Grinnell and assisted Grinnell in researching books on the Cheyenne and the Pawnee. He wrote several early tribal histories and was an early explorer in the field now known as ethnobotany. Having obtained and cultivated many of the old varieties of Indian corn, he was co-author with George F. Will of Corn Among the Indians of the Upper Missouri, published in 1917. Winning entries from the Nebraska Literary Heritage Association's 2010 Short Story Contest are now on display in the Heritage Room. The age divisions for the contest are Kindergarten through 2nd Grade, 3rd through 5th Grade, and 6th through 8th Grade. The 2010 Mari Sandoz Heritage Society Annual Conference will be held March 25-27th in Chadron, Nebraska. This years conference is titled "Son of the Gamblin' Man: Identity on the Plains." The Conference will focus on Sandoz's 1960 novel, Son of the Gamblin' Man, and will explore concealed and conflicted identities in the American West and law and life on the frontier. Accompanying the Conference, the Mari Sandoz Heritage Center will host a special exhibit of materials relating to artist Robert Henri (born Robert Henry Cozad). Letters from Grass Country--"a collection of essays about poets from the Great Plains, edited by Mary K. Stillwell and Greg Kosmicki." Lost Originals--"a collection of Greg Kuzma poems that have not appeared in book form, edited by Kathleen Cain and Greg Kosmicki." Aspects of Robinson: Homage to Weldon Kees, edited by Christopher Buckley and Chris Howell. Natural Theologies: Essays about Literature of the New Middle West, by Denise Low, past Poet Laureate of Kansas. Talking Out of Turn: Poetry by Nebraska Women, edited by Sarah Mason, Heidi Hermanson, Liz Kay and Jen Lambert. It looks like there is a lot to look forward to this year! Postscript: Backwaters Press has announced that it will be accepting submissions for The Untidy Season: An Anthology of Nebraska Women Poets through December of 2010, for publication in Spring, 2012. Contributors must be women born or currently living in Nebraska, or have previously lived in Nebraska for more than a decade. More submission guidelines on the Backwaters Press homepage, at the link above.